We’ll leave you to feast your eyes and satisfy your soul. Food is an edible art; both visual and tasteful. And, it’s hard to move away without drooling over it; especially, when people make it look even more tempting on Instagram. Healthy eating is turning out to be the next big thing in India as more and more people are becoming conscious of choosing healthier ingredients to prepare their favourite dishes with. 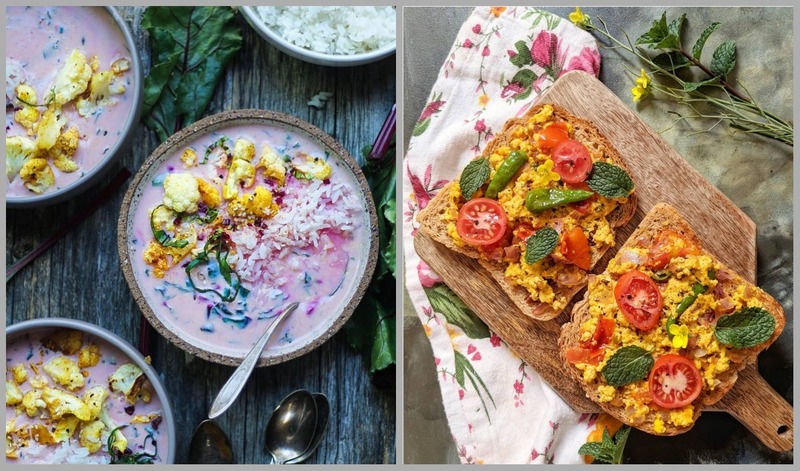 Here is what these incredible food bloggers are cooking up on Instagram. She made these egg-based breakfasts look over easy to prepare and irresistible. What can we say, except she’s definitely the queen of eggs! “Obesity-related diabetes (Type 2) is possibly the biggest reason why Indians are going back to eating wholesome, hearty Indian food. Our spices and condiments have natural healing properties,” Natasha says. Creamy Almond-Coconut milk Raspberry Popsicles. Triple yumminess. Recipe on the archives. Simple, so delish and it's vegan. I used @califiafarms Almond milk(not sponsored, just love it). Long weekend begins and it’s packed with activities. Thankful for all the desserts that’s staring at me, atleast that’s taken care of. Happy Friday and have a great long weekend!! Care for Gluten-Free Vegetable Pancake? For the love of that golden light that sparkles on these delicious pancakes. Shot this while I taught my #onlinephotography (one on one)video class last week. And these gluten-free, vegan, veggie-filled pancakes were inhaled in minutes. Recipe will be up on the blog next week. Her dishes will keep you light on your feet and let you enjoy this summer like never before. “I enjoy delving into a good mix of spices and tastes from all around the world. It’s all about experimentation and I can, without a doubt, say I learn something new every day. Cooking is therapeutic for me, and most of all, it allows my creativity to be shown,” Asha says. I have two questions for you. Have you watched @uglydelicious on Netflix? If yes, what's your favourite episode? . I have seen just 3 episodes so far and massively in love with the Tacos episode. Like they say, tacos talk culture, politics, current affairs, immigrant problems and so much more. It's not just a cheap eat. . It was also fascinating how many kinds of tacos there were including a shawarma like Taco Arabes. . I was dreaming of all taco possibilities ever since I saw this episode. Also, all manner of Indian food combinations in a taco. Primarily all you need is a vehicle - a roti, paratha, Puri, Thepla, anything! Some substantial filling, a bomb of a condiment like a salsa or a sauce, some crunchy garnishes and fresh herbs. . Made these cauliflower tacos topped with mango chilli yogurt sauce, topped with diced cucumber, onion slices and fresh coriander. Parboiled cauliflower went into a marinade of yogurt, grated raw mango, turmeric, garam masala, besan, salt, red chilli and kasoori methi. I then slow roasted the florets in a pan with very little oil for over an hour (also because I forgot about them). They turned beautifully crisp and golden brown. . SAUCE: 1/2 large ripe mango, 3 green chillies, 3 tbsp yogurt, salt and pinch of turmeric. . Make palm sized rotis but thicker than phulka so it takes the weight of the toppings. Layer some coriander, top with cauliflower florets, sprinkle diced cucumber and onion slices. Slather the sauce. Fold up and tuck in. She loves exploring meals with healthier Indian ingredient substitutes, like the Cauliflower tacos that she made using chapati and mango-yogurt sauce! Nandita is all about promoting healthy eating.“People are now realising that you are what you eat; even if you work out for hours, what you eat matters the most. With my recipes, I intend to make people incorporate health eating into their lifestyle,” Nandita says. She made this ‘sprouts and corn salad’ look like a bowl descended from heaven! “My dream is for the world to know and acknowledge ‘Real Indian Cooking’, which is an ancient art where ‘food is considered a medicine that heals’. I hope to make people fall in love with Indian food meanwhile inspiring them to cook these healthy and healing dishes at home,” Uma says. Her passion to learn and explore is evident from the ‘hits and misses’ series; however, her Instagram page is surely a hit with healthy food lovers. “Fuss-free, easy, and quick cooking defines my recipes. I like to play with flavor, fuse different cuisines occasionally and have fun while cooking,” Kankana says.